Give us a call or come on down to the shop and let our staff assist you in finding what you are looking for. No appointments necessary and most installations can be done the same day while you wait. When it comes to car audio in Whittier Tint Shop is the first first choice. We specialize in all phases of car audio: Car stereo, car amplifiers and subwoofers, car speakers, in car navigation, in car video DVD systems, backup cameras, car satellite radio, car HD radio and bluetooth, iPod® & MP3 integration and adapters, car LED lighting, plus car alarms, auto security, remote car starters, keyless entryand more. We are authorized dealers for many car audio and car stereo product lines including: Kenwood, Pioneer, Alpine, JVC, MTX, SoundStream, Jensen, Boss, Cerwin Vega & more. We have an experienced staff of installation technicians to do your job right and to do it now. Our sales and installation staff have years of experience. 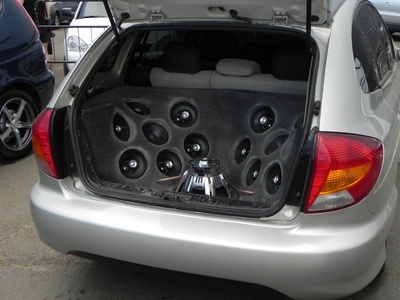 How about the latest in car audio in Los Angeles County. Check out our selection of car radios with HD Radio and Bluetooth, Sirius XM Satellite Radio hookup, In Car GPS Navigation, plus see a great selection of In Car Video systems & Rear View Cameras. Do you want to stream your favorite music into your car radio without having to hook up any wires to your phone? Check out the selection of Bluetooth Streaming Audio car radios and video decks. It’s now available on many of our car radio products. With Bluetooth streaming audio you can listen hands free and even control the music selection on your phone from your car radio. Do you want separate control of rear seat video for your kids, and a backup camera? We have it all. We carry a full selection of mobile video with overhead flip down video screens, headrest video & headrest monitors with DVD players built in. Whittier Tint Shop provides custom auto services to all of southern California. We specialize in window tint, alarms, audio, video, wheels, tires, auto accessories and much more. Call or come by during our regular business hours and our helpful staff will assist you in achieving the look you want for your vehicle. No appointment necessary! Website designed by TWT Inc. Copyright © "WTS" 2015. All rights reserved.